Mechanical Bull Riding and Western Events is what we do. Having a mechanical bull ride at your event will guarantee laughs, smiles, and memories that will last a lifetime. When we provide bull rides, we customize each ride to the riders ability. Young riders ages 5 and up to the wiser generation can enjoy bull riding. 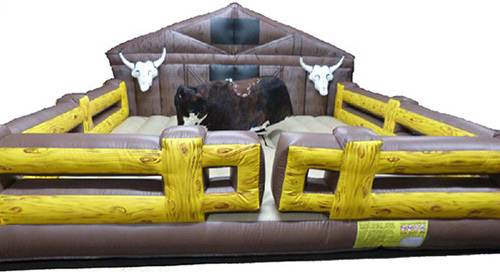 We carry many different types of bulls and bases for different types of events and venue dimensions. Our Mechanical Bulls allow custom rides and the programmed rides which allow us to give the same ride to each cowboy and cowgirl for competitive events. It also allows our Cowboys to operate the controls for variable bucking speed and variable rotation speed which makes it suitable for cowpokes 5 years old and up and maximum speed for the real cowboys in the crowd. When you want the best equipment, best prices, and the most professional cowboys, give us a call. 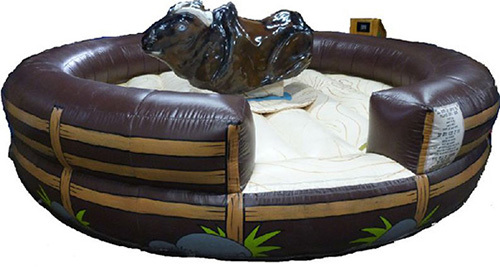 Our Deluxe Mechanical Bull brings with western theme to any event with its western corral look. Enter the octagon and see who taps out first! This is the bull base and bull that can fit in the smallest of venues. Our Macho Bull is designed to fit in smaller spaces and brings the western theme to your event. This bull is also catered towards those who have limited space. Our American Bull takes the most amount of space, but it is the best for allowing people to watch and the easiest for your riders to get on and off the bull. If you are looking for the best Western Theme Party Package, you have come to the right place. Our Western Theme Party Packages include music, bands, decorations, games, activities, employee gifts and grub (catering). Check out the mechanical surfboard. If you are planning a Luau party, you will need the mechanical surfboard to really make a splash. Chicago Party Rental Chicago Bounce House, Moonjump Rental, Bounce House Rental Illinois, Tent Rental, Table Rental, Chair Rental, Dunk Tank Rental Chicago, Concession Rental, Inflatable Games, Obstacle Course Rental, Mechanical Bull Chicago, Casino Party Rental, Arcade Game Rental, Xbox Rental, Wii Rental, Carnival Games, Theme Party, Company Picnic Rental, Costume Rental, Entertainers, Winter Party, Season Party, Audio Equipment, Video Equipment, Zipline Rental, Mobile Ziplines, Extreme Rides, Party Inflatables, and Wipeout Party Rentals. Birthday Party, Post Prom, Communion, Wedding, Fun Fair, Casino Party, Bar Mitzvah, Bat Mitzvah, School Lock-In, Graduation, Promotion, Grand Opening, Festival, Fraternity and Sorority Events, Company Picnics, Team Building, Team Bonding, School Carnival, Church Retreat, Bachelorette Party, Bachelor Party, Anniversary, Luau Party, Customer Appreciation Party, Super Bowl Party, World Series Party, Western-Themed Party, Engagement Party, Sweet Sixteen Party, Christening Celebration, Dances, New Born Celebrations, Block Parties, Wedding Receptions, Fundraising Events, Corporate Events, Dance Party, Reunions, Holiday Party, Night Club and Bar Events, Trade Shows, and much more! Contact us today for your best selection in Chicago Party Rental Fun.